Henry David Cook was one of the original founders of Cook’s Mechanical Services. CMS was not just a company or a business to him...it was an extended family. The extension of his family did not end with the employees and their families but included his customers. Integrity and honor were words David lived by. He applied them to all aspects of his life and always used his Christian faith as a guide. David was a strong supporter of his community, local charities, and local businesses. As a leader and mentor, he shared his knowledge and believed in planning for the future making CMS his legacy for future generations. 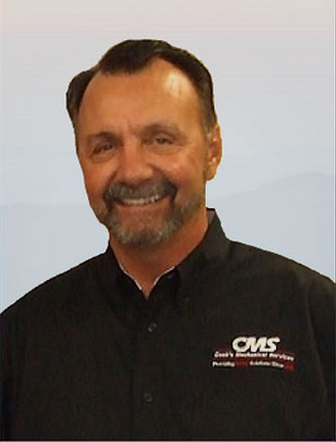 David Cook was the heart of CMS. He believed in witnessing to everyone and sent out daily devotions. He believed in the power of prayer and was always praying for our families. He truly cared and made us part of his family from the first day of employment. He was always helping out someone, whether it was advice on buying a car or how to handle your children but mostly on how to be a better Christian. He was always pushing you to be the best you could be and he strongly believed the path was found in the bible. He was truly loved and will be greatly missed in the office. We are so fortunate to have been part of his life and his CMS family. I didn’t know you very long, but the atmosphere you established made me feel like I knew you forever. I hadn't met a more genuine person that puts everyone else first...You will be missed by everyone you came in contact with simply because the way you lived. You were a great role model. Words can’t hardly describe a man like Mr. Cook. Words can hardly describe a man like Mr. Cook because there are so many great things that can be said. We are truly blessed to have even been able to know him, but we are even more blessed to be able to be a part of his team and CMS family. We can’t even explain how great it is to be able to work for a Christian group of people who are not ashamed of their faith! Mr. Cook always referred to us as the hub of the wheel. He would stop in and ask us if we were keeping all the guys busy and make sure we were always taking care of the customers. No matter what, he always told us how much he appreciated us for being there. It was so awesome to get Mr. Cook's call on our Birthday’s and work anniversaries and him tell us again how much we were appreciated. He did this with all of his employees and never forgot us. We will carry on his legacy by continuing our work and by proudly taking care of our customers. Although it really doesn’t seem fair, we know that Mr. Cook is now healthy and not suffering anymore. Thanks to God, we’ll be able to see him again one glorious day! Until that time, he is going to be greatly missed by all! Mr. Cook truly cared for his employees. I always appreciated him going out of his way to call me for birthdays, work anniversaries and especially those Atta boys. You never left a conversation with him that he didn't challenge you to grow as a person. You never left being the same! He was a very generous man who cared for everyone in the organization the same no matter what they did or how long they had been there. A real man not many left like him. A man of his word, no paperwork needed. An owner, a boss and a friend. To him, we were not just employees, we were people and if we needed help he was there. If we were in the hospital, he came by and checked on us. He was an investigator and could find the truth, Perry Mason or Colombo had nothing on him. I could go home every night for 28 years and feel good about who I worked for knowing we could be honest and do what is right for the companies we service. I'm really going to miss my friend and the man who was solid as a rock to us all. have done for me and my family. I’m writing this letter because there are things I want to tell you. I know myself well enough to know that my emotions would never allow me to get through it if I should attempt it in person, and ultimately these things would get left unsaid. Therefore, I have chosen to take the wimpy way out and do it via letter. First, I want to thank you for all that you have done for me and my family. We have prospered far beyond my wildest dreams because you took an uneducated, and sometimes hot headed kid and mentored him. Over and over again, you have given me opportunities that I in no way earned. I guess that’s why they call them blessings. Your patience, guidance, and forgiveness have played a dominant role in my life and have helped shape who I am. But it goes way beyond just me and my family. It extends to literally dozens of families and hundreds of people. You told me one time that if the Lord took you tomorrow, you could not complain because he had blessed you so richly. You said that you have been able to do more things and go more places than you ever thought possible. Again, I believe it to be much bigger than that. Because you allowed the Lord to work through you, many, many more can say the same thing. Because you had a vision and pursued it, not only with persistence but with a passion to do in a fashion that pleased the Lord, he had a vehicle which to bless many others. Who knows how many homes and automobiles have been purchased, how many tuitions have been paid, and how many families have wonderful memories of vacations together as a result of your efforts. However, the material benefits pale when compared to all the wisdom, guidance, compassion, and so many other fruits of the spirit you have shared and freely given to countless people. I guess what I’m trying to say is that you have made a difference. A huge difference in my life and so many others. I can honestly say that you have done more good for more people that anyone I have ever known. For many years, I have thanked God for you and the opportunity to have served him with you on a near daily basis. I will always be in your debt.